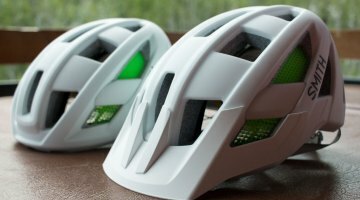 Back in September at Interbike, we saw Smith Optics present the Forefront, a mountain bike helmet built to incorporate the Koroyd honeycomb-like material and designed to seamlessly integrate with the brand’s well-known sunglasses. At Sea Otter in April, the Forefront was released into the market for consumer purchase. 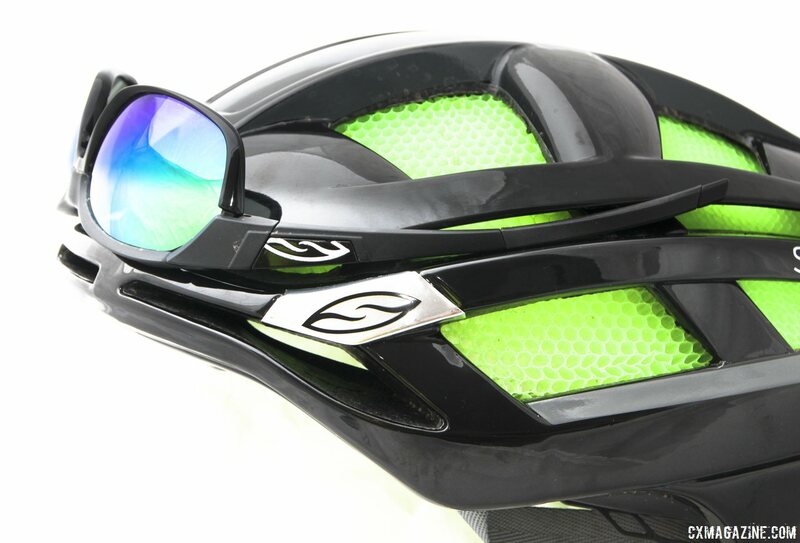 Now, Smith Optics has entered the road side of the market with the Overtake. 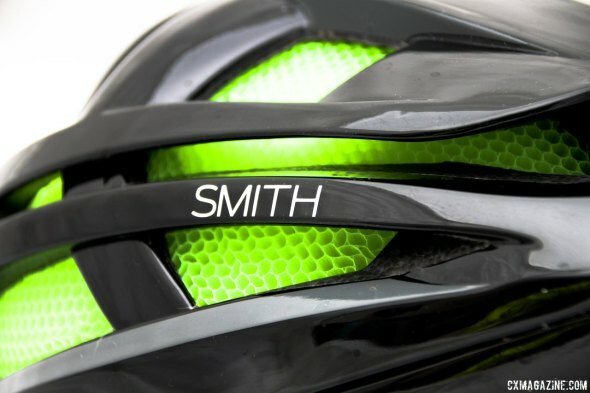 “By focusing on protection, aerodynamics, ventilation and low weight, Smith created a protection system that helps racers enjoy the ride more, time and time again,” the company says. Weighing in at 250g (288g for our size Large helmet), the Overtake offers lightweight protection and maximum ventilation through its Aerocore™ construction featuring Koroyd® (the same as the Forefront). Koroyd is a series of polymer cores that absorbs 30% more energy than traditional EPS foam. 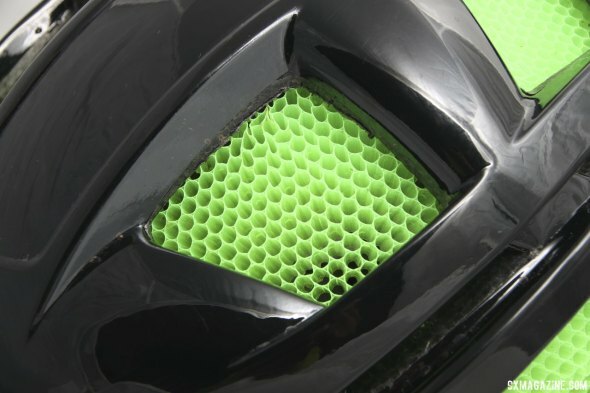 Unlike traditional helmet designs, the company claims “the use of Koroyd provides a significantly increased venting surface for better managed, highly focused airflow.” The Koroyd also helps reduce the profile of the helmet, which helps with aerodynamics and reduces the leverage on your head in an accident. 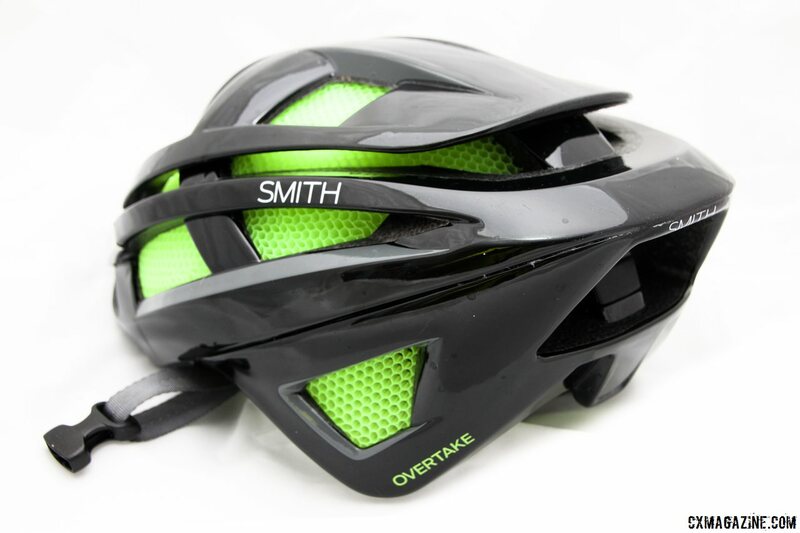 The aerodynamics of the Overtake, according to Smith Optics, are quite impressive, and their tests have shown the helmet to be faster than the revolutionary Giro Air Attack, and almost as slippery as the Specialized Evade helmet. Aerodynamics may not be a cyclocrosser’s top priority, but if Tim Johnson is spending time in the wind tunnel, it probably doesn’t hurt to adopt small advantages if your goal is to be a top cyclocross racer. Of course, the helmet is also designed to integrate Smith’s sunglasses perfectly, with the adjustable VaporFit cage staying clear of sunglass temples, and the top of the helmet providing a perfect perch for your glasses when you’re in the dark of the deep woods or Belgian winter. 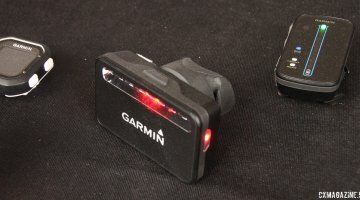 Three sizes will be available in 12 different colors: one to match any kit. Certain colors will also feature MIPS (multi-directional impact protection system) technology in the liners to reduce the rotational forces to the brain during impacts. 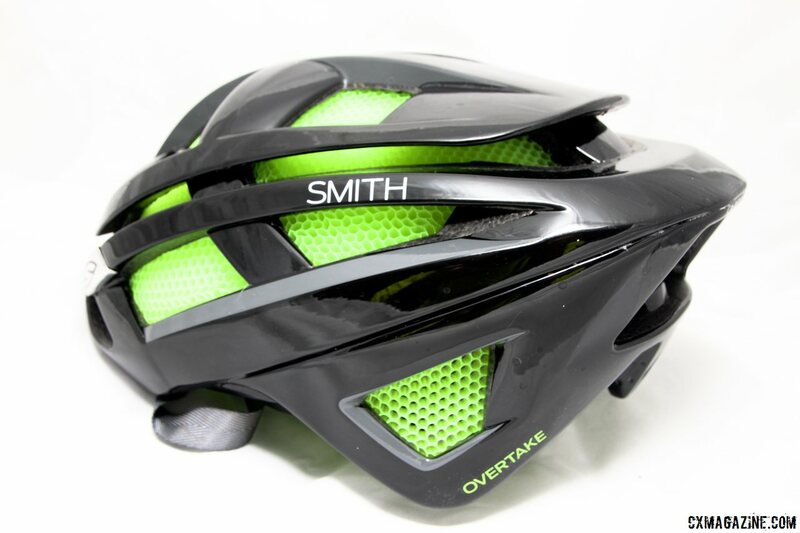 We’ve already given an early Smith Optics Overtake bike helmet a few test rides for a review, and have come away impressed with the fit, weight and ventilation. In terms of fit, the Smith Optics VaporFit dial-based system tightens the entire ring that surrounds your head, not unlike the Rollsys system from Lazer. 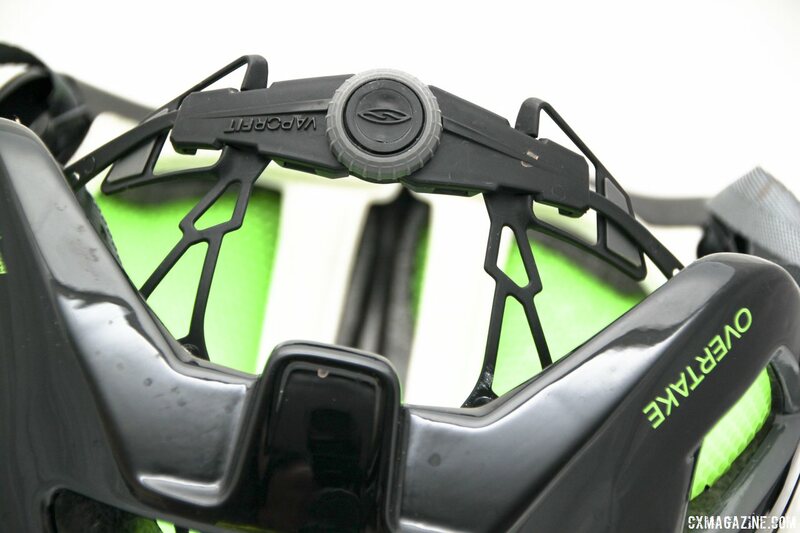 The plastic cage that surrounds the back of your head is also adjustable in height, with three different height options. 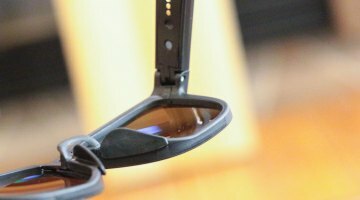 After taking some time to set it up correctly, the Overtake was secure on a bumpy downhill mountain bike ride, without sliding back or down, and never once interfered with our Smith Overdrive sunglasses. The weight of the Overtake helmet is pretty competitive with top-of-the-line helmets, and our size Large test unit weighs 288g, or just over 10 ounces. 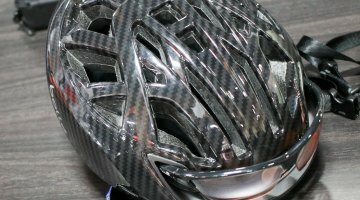 Less weight, all other elements being equal, means that your head should be subjected to less force in a crash, and is easier on the neck muscles on long rides. 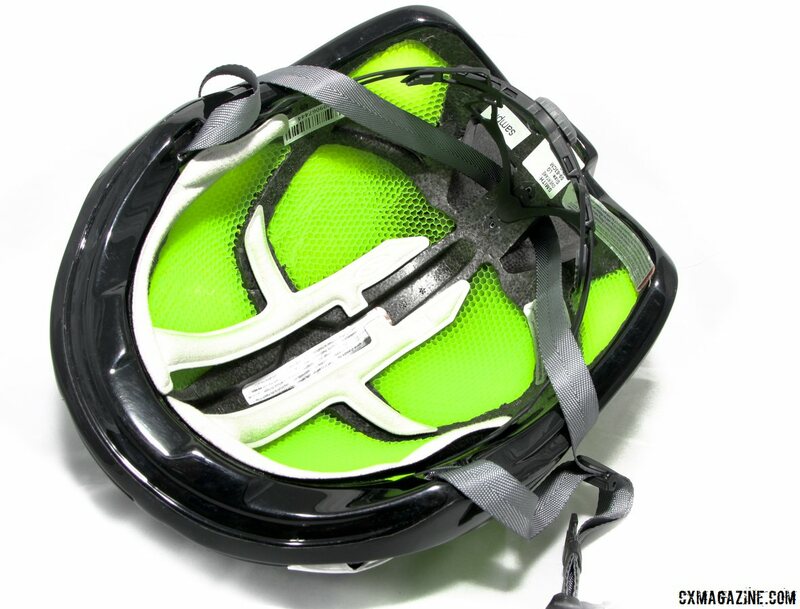 In our testing, the ventilation of the Overtake helmet has proven to be very good, but it feels a little different than a typical road helmet with open, but smaller vents. 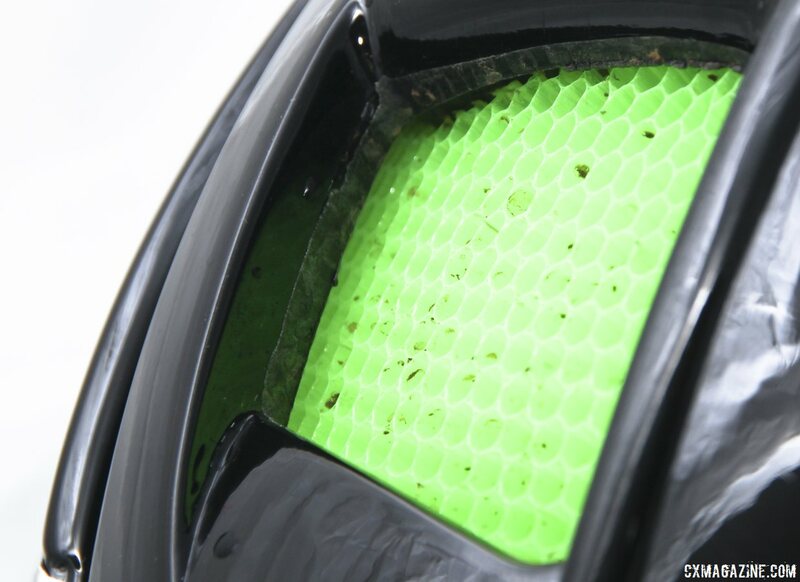 The four biggest vents are huge—far bigger than on typical helmets, but the Koroyd material also fills the vents and acts as a potential barrier against wind directly hitting your head. Stand around on a windy day and your fresh hair style is likely to remain in tact, as the honeycomb structure of the Koroyd blocks gusts of wind unless they’re perfectly aligned with the structure. We have a few minor complaints that are pretty specific to our mud-loving readers. First, the Koroyd honeycomb structure has quite a bit of surface area and structure to catch and retain dirt and mud. A quick spray down in the shower didn’t quite restore the helmet to like-new condition, but powerwasher or brush might. 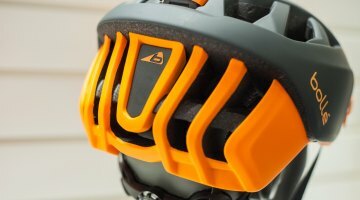 Expect a bit more helmet “maintenance” if you live in a muddy region. Also, the light grey colored pads show dirt pretty easily, and after one muddy ride, they looked like they could use a good washing or even a little bleach to look new again. It’s not like anyone else will notice, but putting a clean-looking helmet on is always more appealing than a dirty one. Obviously we did not verify safety claims, but are certainly thrilled if this light, comfortable helmet is also safer for our noggins by absorbing more energy during impact. We’d be lying if we said the material doesn’t make us wonder about the chance of the sharp edges of Koroyd cutting our scalp if we were to suffer a major head impact, but Scott maintains the material is designed to crush in a crash, and regardless, a few papercuts would still be far preferable than a concussion. Lastly, the aesthetics certainly won’t please everyone, especially the bright green Koroyd material (more colors are coming), but we cyclocrossers often appreciate a unique look and don’t feel pressure to fit into a peloton. We like the different look, especially because it doesn’t shout roadie aero, while still offering the aerodynamic benefits of other brands’ designs. 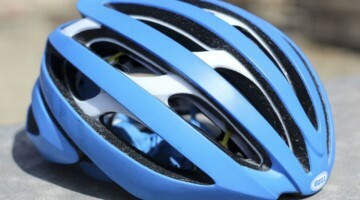 Stay tuned for a long term test, and see more helmet reviews here to find your perfect lid. Smith Optics boasts better-than-Giro Air Attack aerodynamics. The Overtake from Smith Optics. Koroyd surrounds your brain. CXers may not like the light colored pads. Koroyd looks like a bee hive, but removes the sting of a crash. CXers may find dirt and mud sticks to the hive of the Koroyd. 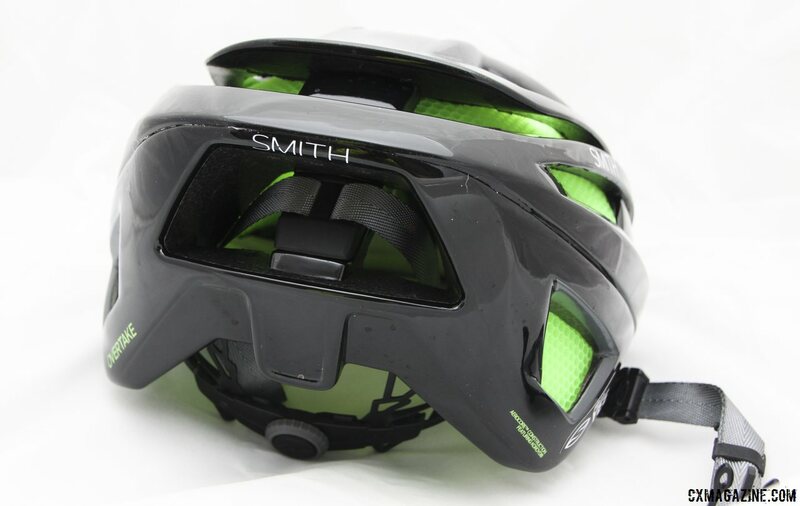 Smith helmet easily carries Smith sunglasses. 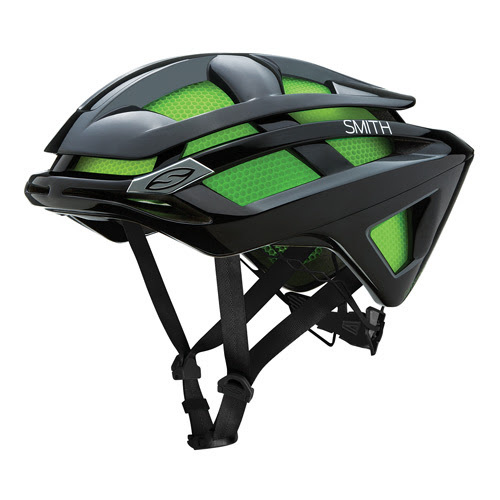 Smith's new Overtake road helmet, with its unique Koroyd liner. Mud is going to be hard to get out if this iddy biddy honeycomb holes? Don’t ya think? Rob did you read it? We addressed that exact topic. Only $310! Wow, that will surely attract newcomers to the sport. Intact is one word, not two. Pet peeve. I don’t know why people insist on splitting that word. It doesn’t mean the same thing. So I will start off by saying this. I used this exact helmet in a severe crash last night, my head slammed the concrete road, dead on at the speed of ~19-21MPH. It killed the helmet, I got up and after a few moments of disorientation, I was fine. If I had not had a helmet on, I am sure to this fact, I would not be able to write this letter today. I just hit that hard. The helmet did its job and I walked away. I will say this, the honeycomb did push into my skin, but no bleeding or anything. More like a mild carpet burn. But considering the damage to the helmet and the impact, any helmet may do this. I’m sold on this helmet and will buy another identical to it. Glad you’re ok. Did the same three days ago wearing a different brand helmet (older model). Helmet did it’s job and was busted in a dozen spots but after a few minutes of figuring out where I was, all is good. After that incident I decided to splurge on a helmet and bought this one with the MIPS. Hopefully I’ll never get to test how protective it is but I wont get on a bike now without a helmet on my noggin. The road rash is another story.